Summertime sees numerous festivals here in the UK, but it's not just at home where festivals are enjoyed at this time of the year. In Tibet too, June, July and August is a time when several important Buddhist festivities take place and, just like our festivals, they are characterised by music, dancing and great celebrations. Here are the proposed dates for three of Tibet's most significant festivals in 2017 along with information about where they're held, what to expect and the holidays we offer in Tibet that include them. Saga Dawa celebrations are held throughout Tibet and other Buddhist countries. One of the most unusual festivals takes place at Tarboche at the foot of sacred Mount Kailash. The festival coincides with the full moon of the fourth lunar month. Next year this has been set for the 9th June 2018. What are the celebrations about? This very significant and ancient Buddhist festival honours the life of Buddha through prayer, meditation and giving alms. It is believed that good deeds and prayers are multiplied a thousand fold during this event. Each year, in the dramatic mountain setting of Tarboche, a towering, ceremonial flagpole is raised. The pole is bedecked which hundreds of colourful prayer flags. Once raised, it is believed that the wind carries the prayers to the heavens but, if the flagpole is not completely upright, it’s thought that bad luck will follow. So no pressure on the pole setter-upper! If he succeeds in his mission there are cheers of joys from the assembled pilgrims. Buddhist pilgrims travel to Tarboche in their thousands and, during the ceremony, many of them will circle round the flagpole, chanting and praying as they walk. Mounds of incense and juniper are burnt, printed prayers thrown to the wind and horsemen occasionally race around the flagpole in traditional costume. It’s an amazing insight into Tibetan Buddhist culture. In Lhasa hundreds of people gather in front of the Potala Palace to pray - either standing upright or prostrate - and there’s a mass picnic in the local park. Throughout the rest of Tibet, butter lamps are lit in Buddhist temples, prayers said and alms given to monks. 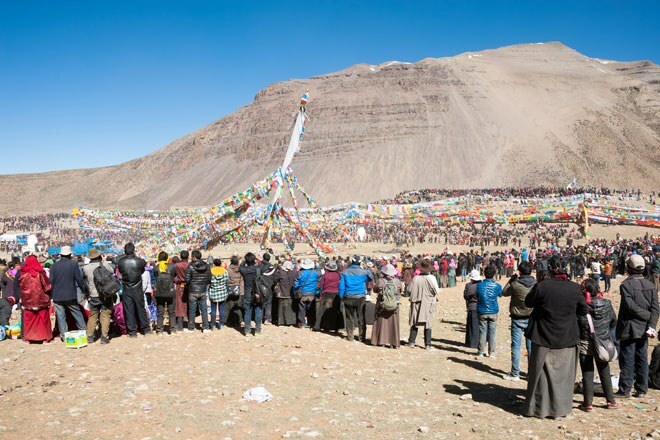 Join our Mount Kailash & Saga Dawa Festival trek to experience the festivities; walk along the shores of Lake Manasarovar, complete a full kora of Mount Kailash and spend a day at the joyful Saga Dawa festival. The festival is held at the Tashilumpo Monastery in Shigatse – Tibet’s second largest city. The three day event takes place in the fifth lunar Tibetan month. In 2017 it’s due to be held on the 8th, 9th and 10th of July. 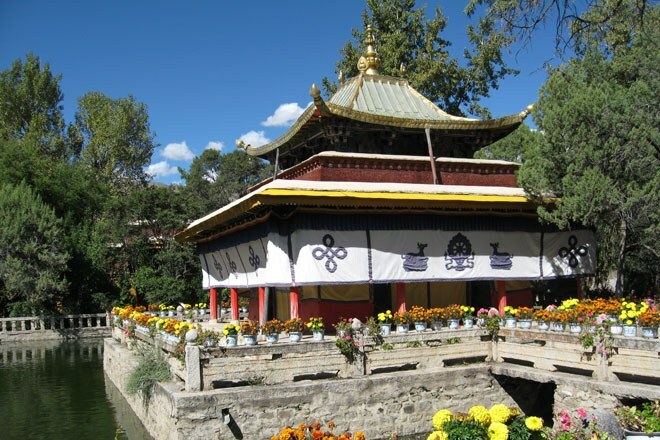 The festival was created some 500 years ago by the first Dalai Lama – Gendun Drupa – and is unique to the monastery at Tashilumpo. Each day, different portraits of Buddha that have been hand embroidered on silk or satin are exhibited. The climax of the festival though is a spectacular ceremony in which a huge, 4-storey, painted, thangka is unfurled in front of hundreds of gathered pilgrims. This is also known as the Buddha-unfolding ceremony. Thousands of pilgrims and tourists gather and Cham dancers perform making it a vibrant, unique occasion. The July departure of our Definitive Cultural Tour of Tibet attends the ceremony as part of a 16-day, in-depth tour of the most important religious and cultural sites in Tibet. It is usually held during August in accordance with the lunar calendar. The 21st and 22nd of August are the dates for 2017. The Drepung Monastery and Norbulingka Palace in Lhasa are the two main sites of the Shotun festival. Also known as the ‘yoghurt banquet’ festival. This festival was traditionally timed for when the lamas (monks) came back from cultivating their crops in the mountains and were welcomed home by local people with yogurt and an outdoor banquet. After 1642 the Drepung Monastery became the political, religious and cultural centre of Tibet. Each year tens of thousands of people went there to give yoghurt to the lamas and to ask for blessings. Tibetan Opera groups and wild yak dancing troops all came to perform - giving rise to the Shoton Festivities. The Drepung is still one of the major monasteries of the Lhasa region and on the first day of the festival a huge thangka unfolding ceremony is held there. A 500-square-meter painting of the Buddha is carried by over 100 lamas to a platform on a hillside at the back of the monastery. There it is unfurled ready for the first rays of the sun to strike it. This ceremony is called 'Buddha basking in the sun'. The occasion is marked by the throwing of white scarves. Within two hours, the thangka is once again rolled up and returned to the monastery for safe keeping till the following year. After the unfurling ceremony at Drepung, festivities begin the following day at the Norbulingka Palace. The residents of Lhasa gather in the park at the palace and celebrate by eating yoghurt and watching the operas. Professional and amateur opera troops perform traditional Tibetan operas. Alongside the opera performances there are dances and even yak and horse races to watch. 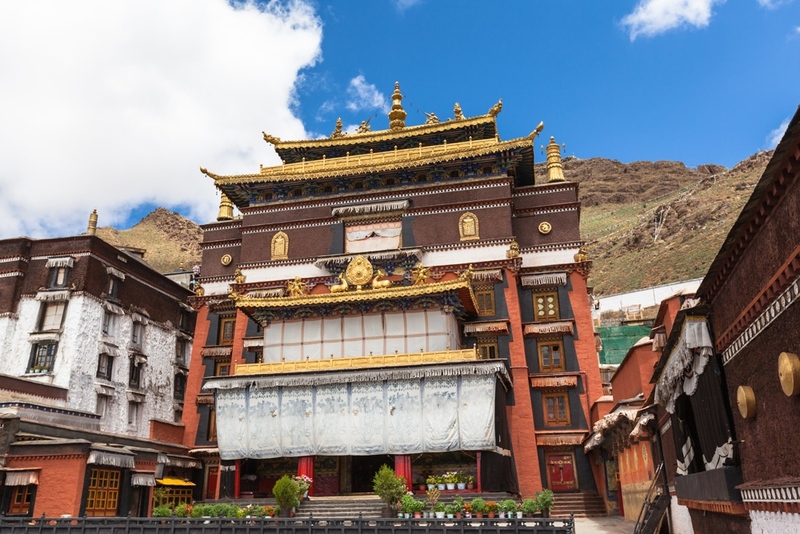 Travel on our Definitive Cultural Tour of Tibet in August and you will be able to join the pilgrims for the grand thangka unfurling at Drepung. You will also explore the landscapes and cultural sights of this fascinating Himayalan land.